Vegetables are more tolerable when they're cooked in a certain way, or presented in a more fun manner, than just plonking them on a plate. 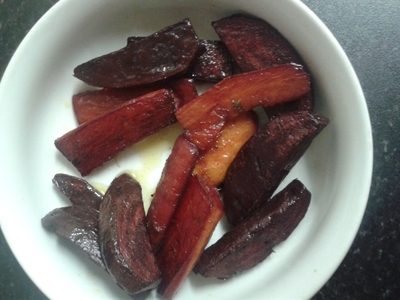 To make use of the earth vegetables which are now in season in the UK, I've cooked a few carrots, and beetroot in an easy-to-eat, fun way. 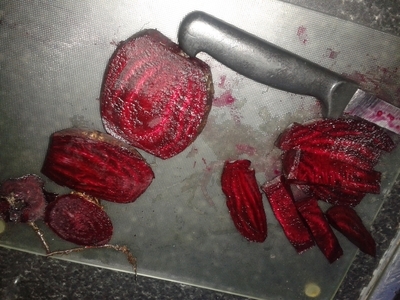 I am determined to make the humble vegetable a friend to my niece and nephew, who really struggle with root veggies - beetroot in particular. Be prepared for pink-stained hands, pink-stained carrots, and a nutrient-rich side dish. Thoroughly wash the beeroot and slice it into 'chip' sized chunks. 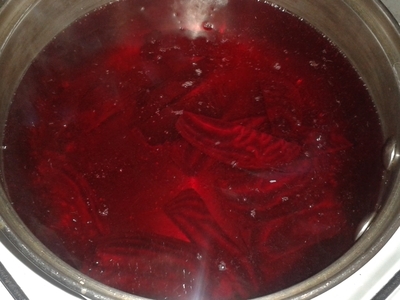 Place in a saucepan and boil for 10 minutes. 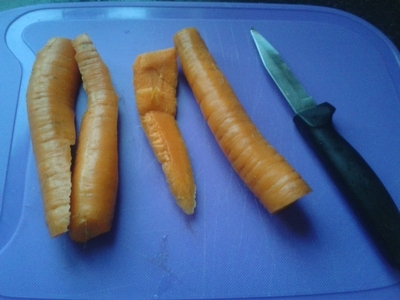 Wash the carrots and halve. 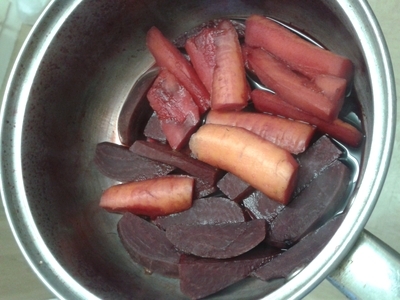 Place in the same saucepan as the beetroot for the last 5 minutes of cooking. Pink carrots are just what you want - any sort of colour associated with Barbie, toys, or general 'playing', go down a treat. 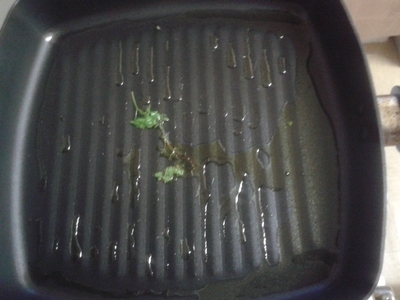 Remove the vegetables from the saucepan and place in a griddle/frying pan with the oil and all of the seasoning. Cook the vegetables over a medium heat for 10 minutes. Coconut oil is the perfect fat - it allows the nutrients of the carrots to be absorbed more easily. 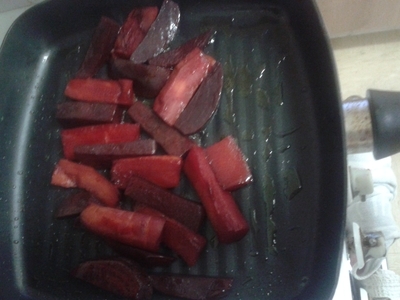 Remove the carrots and beetroot from the griddle pan and arrange on a plate. 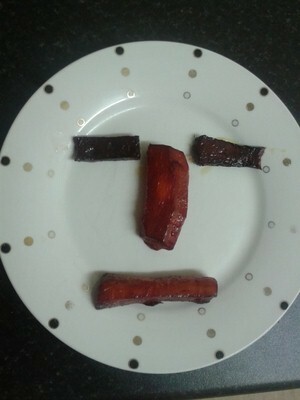 I like to arrange the vegetables like a grumpy face, so the little ones don't see beetroot, and carrots, but something they can enjoy eating. 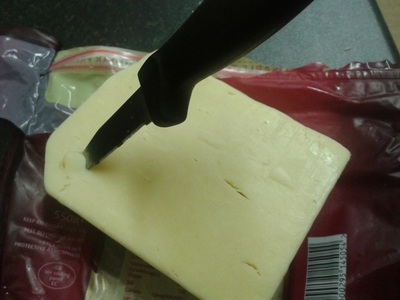 Carve out two small knobs of cheese using a knife. 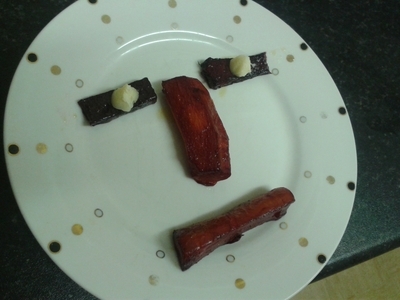 Add the two small pieces of cheese to the beetroot 'eyes' of the dish. The cheese makes a nice additive, and cheese with beetroot is a fantastic pairing. 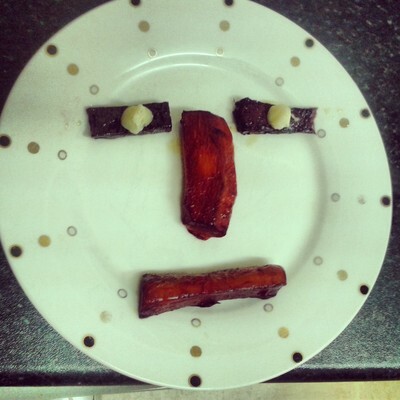 When I served my niece a small plate of these snacks she exclaimed: "Look Auntie I'm eating the nose!". I took that as a good sign.